Through his various artworks and by making cheese, Karl Minnig (1896-1987) brought back his native Swiss culture to Wisconsin. According to the National Archives and Records Administration (NARA), Minnig was originally from Bern, Switzerland and he immigrated to the United States in the early 20th century, According to census records, he became a naturalized citizen in 1928. Minnig married a woman named Florella Ida Minnie Kahl (1904-1975) and together they had a daughter named Ruth in 1932. After moving to America he was drafted for both WWI and WWII. He eventually settled in Mt. Horeb, Wisconsin, where he would remain until he passed away at the age of 90. He never forgot of his love for Switzerland and continued using business pursuits and creative outlets to exhibit his love for Swiss products and culture. Minnig and his wife owned and operated Ridge Cheese Factory where they specialized in making Swiss cheese. Although they stopped producing cheese themselves, the Minnigs continued to sell cheese, as well as other Swiss-style folk novelties within their basement retail store. These crafts and trinkets include: wall shelves, mechanical lawn windmills or “whirly gigs,” and model “Swiss” houses and farmsteads. He was creative in his use of media to channel his artistic works. This included reincorporating cheese boxes, license plates, plywood, plastic animals, and nature itself. The pieces selected for this exhibit include a painting of a Swiss chalet, a model of a Swiss farmhouse, and a lawn ornament windmill. Each of the pieces showcase Minnig’s love of Switzerland, his old home and his heritage. 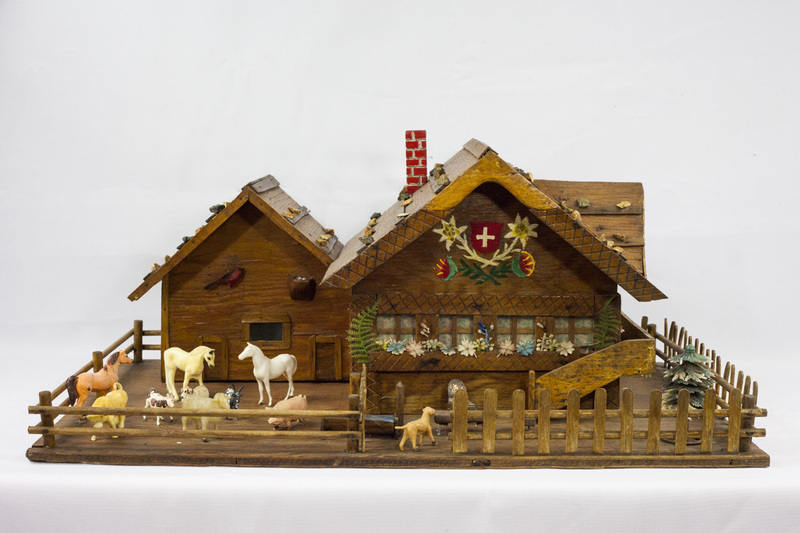 Two of the pieces include a traditional Swiss housing style (chalet or farmhouse) in a beautifully rustic setting. Adorned by animals and bright colors. 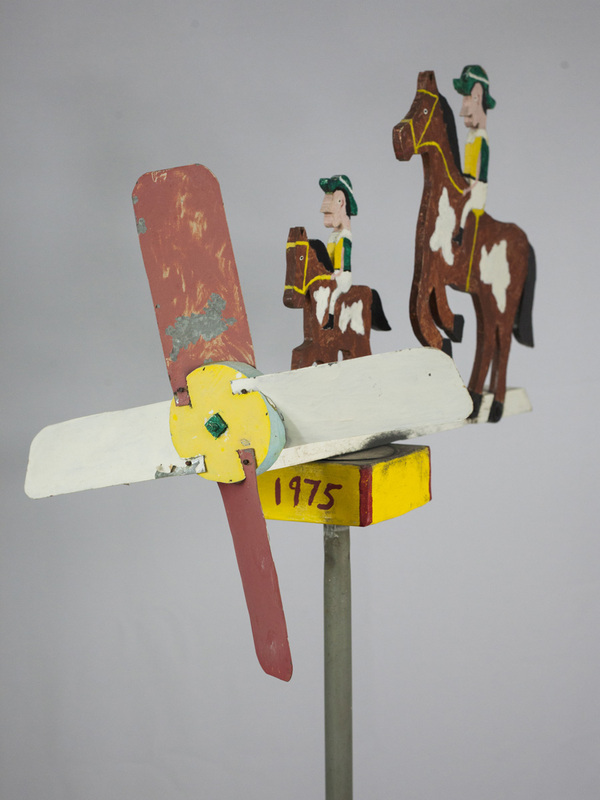 The Windmill shows two horsemen as they ride the winds that turn the blades of the mill. All of the pieces are beautifully bright and were made to bring the artist back to charming memories, but the presumed story as to how the pieces were acquired is unfortunately more dismal. Mr. Minnig’s daughter Ruth (1932-2006) was not able to hold an entire family of her own for a long time. When she was young she married and had a child, but unfortunately she would not enjoy the pleasure of motherhood or be a spouse for her entire life. Her child passed away almost immediately, and her husband, Dale “William” Garfoot, passed away at the young age of 56. They were married for 18 years. Mr. Garfoot is the one who donated the model of the Swiss farmhouse. She would later lose her mother and father, before she herself passed away. The painting was donated to the Historical Society by neighbor Merel Black. Hilda Bigler, another neighbor, donated the lawn windmill or “whirly gig”. Karl Minnig is the embodiment of an immigrant adapting to a new setting while embracing their past. 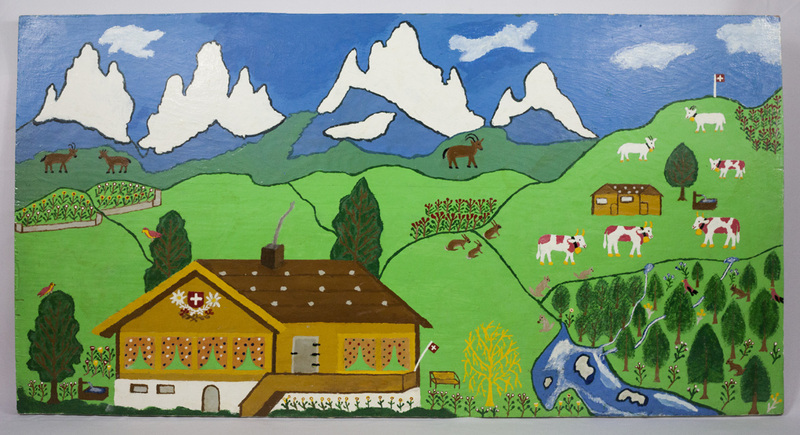 He frequently revisited his home country, and brought back more advancements on his folk art. His artwork exhibit pride and fondness for how he arrived to America, and how he chose to respect his native culture.